Sign up now and get your discount coupon! Cleansing base of the amino acid components gently removes dirt without removing natural protective layer of the skin. Suitable for everyday cleansing of body and hair. 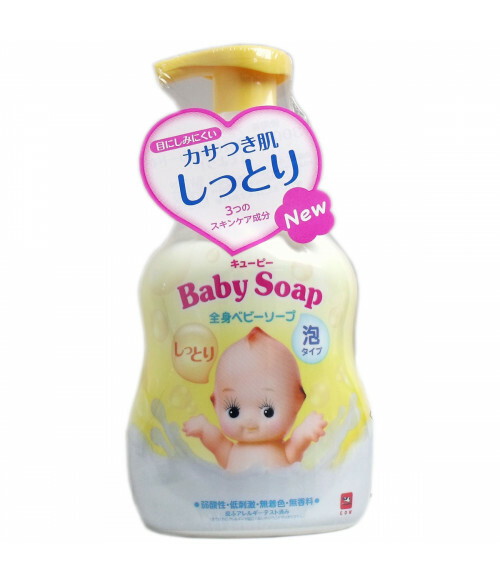 Consists of 3 main components that treat the baby’s dry skin: natural squalane, dairy ceramides and hyaluronic acid. Does not contain coloring and flavoring. Does not irritate the skin. Suitable for adults with sensitive skin types. Skin allergy testing was conducted. Remove the blocker from the pump, press a few times until the foam appears. Take a small amount of foam, wash lightly and rinse out. If you are washing your hair, wet the hair with warm water, take a little bit of foam and wash with gentle movements.Carefully rinse after wards. Before you pour the contents of the replaceableunit in the bottle, rinse well under running water that part ofdispenser that was inside of the bottle and let it dry. When washingthe dispenser don’t press on it so the water does not not getinside. If the water ends up in the bottle the contents won’t befoamy. If foam no longer appears, remove the dispenser from thebottle, flip it and press on it a few times. Do not pour into thebottle substances from different brands and do not dilute with water.When the replaceable unit is in use, pour in the entire package. If redness, itching or irritation appears duringuse, must discontinue use and consult a doctor. If it makes its wayinto the eyes, rinse with water immediately. Keep out of reach ofchildren. Do not store in high or low temperatures or in the directsunlight. Water, DPG, kokamidopropilbetail, sodium lauroylmetilaminopropinat, ceteareth- 60 myristyl glycol, potassium cocoylglycine, dipotassium glycyrrhizinate, squalane, milk sphingomyelin, hyaluronic acid, milk fat, milk sugar, PEG/ PPG/ polibutelenglikol –8/5/3 glycerol, PEG-400, glycerol, citric acid.